John: How is your Zhongwen Chrome extension different from Perapera-kun? Christian: While the basic functionality is similar, Zhongwen offers a number of features that are not present in Perapera-kun. 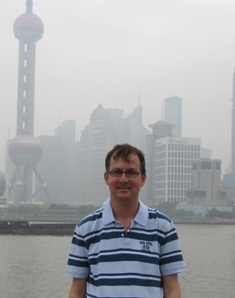 Those features are mainly useful for those of us learning Chinese. For example, if you’re using Skritter to study your Chinese characters, Zhongwen allows you to directly export words to one of your custom study lists that you can set up on Skritter. 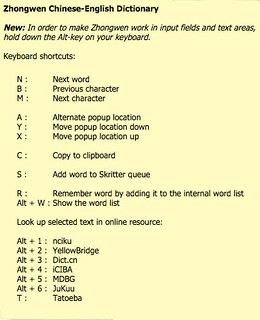 You just need to press “s” on the keyboard and Skritter will open up in a new browser tab where you can then easily add the highlighted word from the popup to one of your study lists. I think another useful feature is that Zhongwen lets you quickly look up example sentences on Tatoeba and on Jukuu. For Tatoeba press “t”, for Jukuu press “Alt-6”. If that sounds complicated there’s help for you: Every time you enable Zhongwen by clicking on its icon, a help window will briefly open up showing you all the keyboard shortcuts. Another thing you might want to try is this: If the English translation shown by Zhongwen is somehow not sufficient for you to grasp the meaning, you can look up the word in one of several dictionaries that are accessible via keyboard shortcuts. For example, pressing “Alt-1” will look up the currently highlighted word in nciku. You can also try “Alt-2”, … “Alt-7” for other dictionaries. And if you want to keep your own list of words for exporting them to Anki later, for example, Zhongwen lets you do this too: Press “r” for adding the word to a built-in word list (“r” stands for “remember”) and by pressing “Alt-w” you can bring up the word list and select the entries that you want to export to a text file. Again, don’t let yourself get confused by those keyboard shortcuts. If you can’t remember them, they are shown on the download page or in the help menu that’s displayed when you enable Zhongwen. And the ones you grow fond of you will remember in no time. I’m not sure whether Perapera Chinese is still being supported. As of today, the latest release is from January 2012 and the dictionary that comes with it is at least that old. So if you prefer a more recent version of CC-CEDICT you should go with Zhongwen. J: What other features does Zhongwen have that some users may not be aware of? C: Zhongwen also works in offline mode. When you go to the Chrome extensions page you just need to check the box that says “Allow access to file URLs” under the entry for Zhongwen. Then you can use it to translate HTML files stored locally on your computer. Right next to this checkbox there’s a link that says “Options” that takes you to the options page of Zhongwen. Here you can change a whole bunch of stuff, like the color theme of the popup, the font size (make it bigger for traditional characters!) and you can enable Bopomofo (Zhuyin), etc. You should check it out. It’s for advanced users only, though. So most people will never have to go to this page. Also, if you’re interested, I created a German and a French version of Zhongwen. They’re based on the HanDeDict and the CFDICT dictionaries. You can look for them in the Chrome Web Store. But the English version is the most feature-rich and up-to-date one. J: What if I only use Safari/Firefox/Opera/IE? How can I get Zhongwen in my browser? C: For most of those browsers you’re out of luck. IE, Firefox and Safari use different kinds of extensions that are not compatible with Chrome. However, the newer versions of Opera, like Opera 25 for example, use extensions that are compatible with those built for Chrome. I believe there’s even an Opera extension that allows you to install extensions from the Chrome Web Store, where you can find Zhongwen. I haven’t tried it myself, but maybe some of your readers have some experience with it and can give you feedback. I would recommend installing Chrome as a second browser, though. This way you can use Chrome for Zhongwen and your other browser for your other stuff. By the way, there’s a Firefox add-on called “Zhong Wen“. While the name is similar, I want to point out that it’s completely unrelated to the Zhongwen Chrome extension. J: Is there any way to use it in the Chrome app for smartphones? C: As far as I know this is not supported by Google. J: Are there any other interesting updates coming to the Zhongwen extension? C: I’m always open for interesting ideas, like your suggestion to add links to your Chinese Grammar Wiki. I believe that really adds value for students of the Chinese language. I don’t see Zhongwen as just a dictionary, it’s more of a learning aid and your Grammar Wiki fits in nicely with this goal. On the other hand, I don’t want Zhongwen to become bloated with features that only a handful of people use (and know about!). I want to keep it fairly small and useful, it should do its job and do it well, and fast. I like this concept of linking to external resources that offer extra functionality, like Tatoeba for example sentences; the Grammar Wiki for grammar and usage information; other dictionaries in addition to the built-in CC-CEDICT; and Skritter for studying characters. It doesn’t make sense to integrate all of this functionality in Zhongwen when other sites do a better job in their area of expertise. A pity it only works with Google’s creepy spy-browser.